What better way to say goodbye to summer than to finish up a lingering tank top? 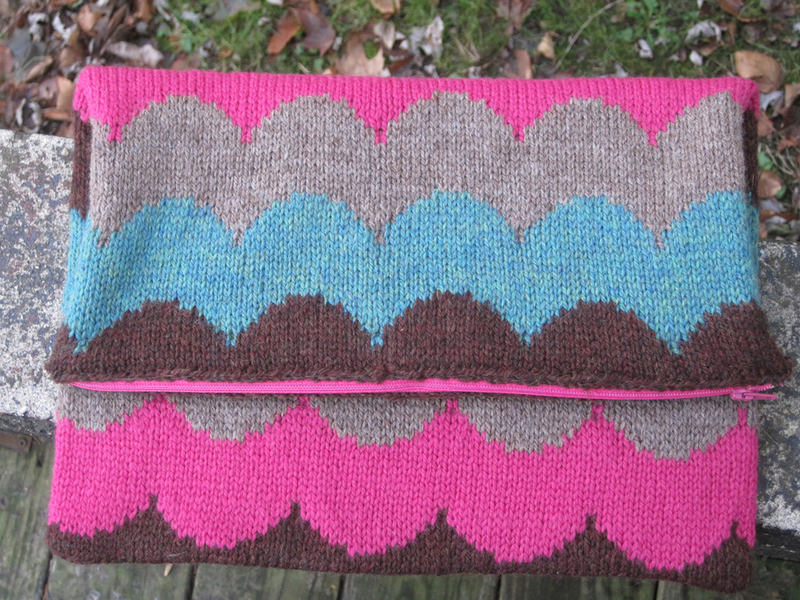 This is Heather Dixon's Erquy--I started it in May and used my extra knitting time to finish it up a few weeks ago. The pattern calls for knitted straps, but after reading that others found they stretched out over time, I opted to buy ribbon and lingerie strap adjusters to make adjustable straps. 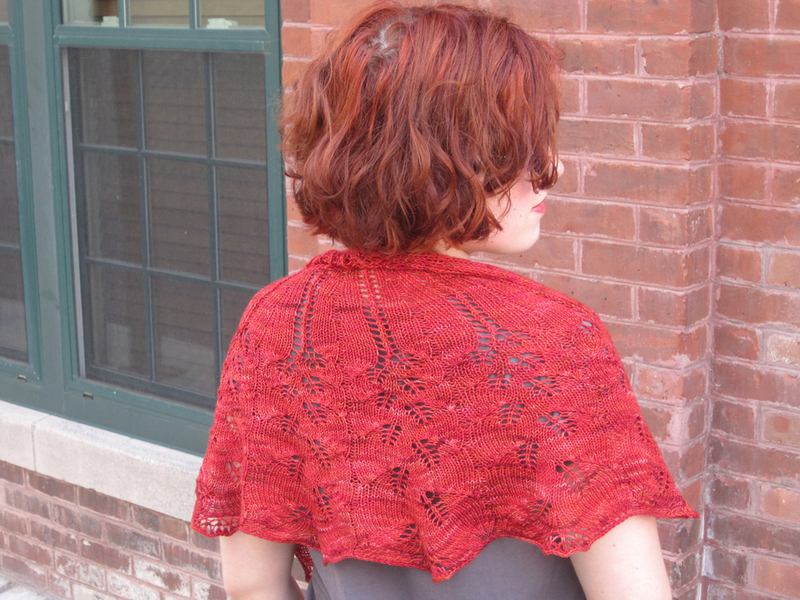 I love the fit and the effect of this yarn! 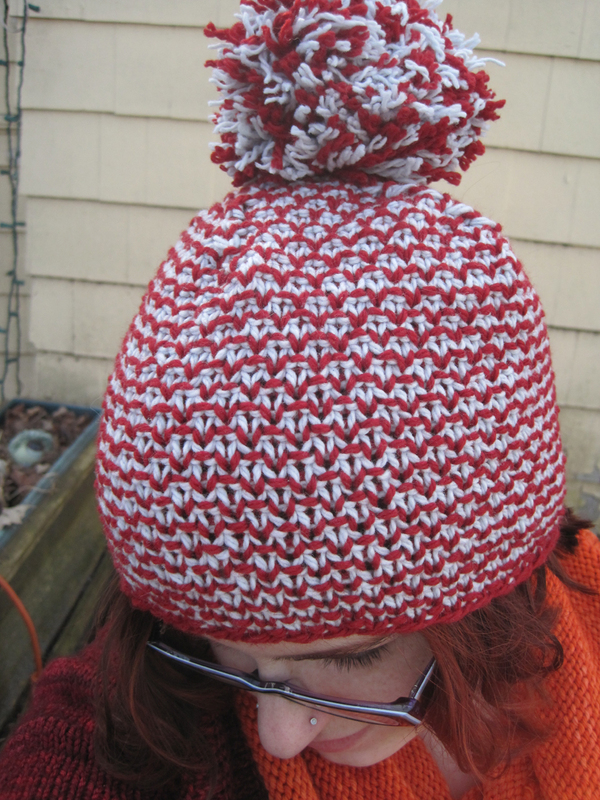 Especially now as a designer, I like knitting other people's patterns and seeing how they think. I think it's really clever how a classic chevron stitch pattern is enlarged to create the shaping of the tank. Does the old-tymey photo effect look familiar? I jumped on the Instagram bandwagon this weekend. I don't completely understand the concept of 'followers' yet, but if you're interested my username is emmawelford. This is my wait-summer-can't-be-over-yet! project and my first crochet garment. I'm loving the colors of Charlemont and the rhythm of crochet is a welcome change to my fiber life. In the personal department, I'm on Day 8 of my Whole30. I've been primal for a few months but decided I wanted to push myself further for a few reasons. Though I didn't eat a lot of junk food previously, I noticed my sugar cravings more after turning primal and realized that it doesn't matter how much or little you eat--addiction is still addiction, and I felt addicted! I'd like to get to a place where I don't feel like I NEED sugar on a daily basis, and where treating myself to something reasonable doesn't start a landslide effect. I discovered I like willpower exercises (feels good in a slightly sadistic way!) Not to mention I'm excited to see at the end of it how my attitudes towards food will have changed. I've already tried and liked so many more new foods since becoming primal--sardines, chicken liver, kombucha, goat's milk yogurt--and I know the list can only continue to grow! Welcome to Day 4 of the Holla Knits blog tour! I'm Emma and I'll be your guide today through the six super-stylish patterns of the Spring/Summer 2012 Collection. I decided to do something fun while reviewing these patterns and styled them into looks I would wear with the help of Polyvore. If you're a Pinterest addict, I'm sure you'll recognize the format of these clothing collages that are everywhere. This was my first time using it and I found the interface very intuitive, plus I love the fact that you can filter results by color. Up first is my Holla Back Tank. I styled it as I wrote in my pattern description (since I'm apparently stuck on this one look), with skinny jeans and a leather jacket. I wish I had a cute cropped jacket like this one, which would give a great sneak-peek of the tank's lace back before you take it off for the big reveal. Perfect for that badass rocker chick look! I'd wear this one for a night on the town with my best friend. Keep reading for more looks and a giveaway! Here is Allyson Dykhuzien's Put a Belt On It. 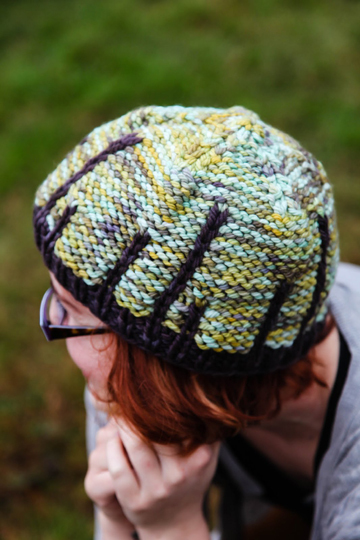 Allyson is the amazing creator of Holla Knits and she busted her chops with THREE designs for the premiere collection! I love gray + yellow so I couldn't resist creating an outfit for this sample. I'm lucky enough to have a job with a very casual dress code, which means I usually roll in wearing jeans and a tee. But every now and again I get the itch to dress ~fancy~ for work and I would totally rock this! A solid skirt and tank allow the gorgeous hand-dyed yarn to be spotlighted. Like my Holla Back Tank, this pattern also features a great surprise--turning around reveals cables and a fun cropped back. I'm a big fan of back details and Allyson's vest delivers. I will admit that I don't usually knit or wear vests because I don't know how to wear them! But I love layers with deep V-necks and I think this is a great modern version of the well-recognized knitted vest. 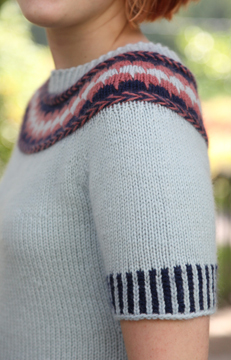 Katie Canavan's Finishing School is a great nautical-inspired top. I can picture wearing this home visiting my mom and going out to lunch with her in Newburyport, a coastal city with a really cute downtown. Cropped red pants and a red floral headband echo the red whipstitch accents. I love headbands of all styles since they work with my hair now, though that was not always the case! Simple sandals keep the look casual and make it easy to take a leisurely afternoon stroll. I remember reading one of Allyson's sneak peek posts of Katie's design, and her mentioning being unsure if Katie's concept would read as too costume-y. I think Katie pulled it off--this top is definitely wearable! I'm impressed with the unique construction description, I always admire when a designer comes up with a new and interesting way to get from Point A to Point B.
Allyson's Umbre Lovre is beautiful and so on-point right now! Knee-length jean shorts and strappy wedges keep the flirty vibe of the off-the-shoulder option without taking it overboard. Bracelets are my favorite type of jewelry, so I'd layer several different ones together for extra fun. This one is a Sunday outfit! Sunday is the only day of the week that both Erik (my boyfriend) and I have the whole day off. We try and do something together, whether it's watching a movie, going somewhere, or just cooking dinner at home. Even the most ordinary activities feel special if we do them on a Sunday, and I think this look is special AND functional! I love love love how this one looks in a hand-dyed option, it really enhances the ombre effect. I agree with Allyson that the hardest part for this top would be picking the colors! Looks like a simple knit, technique- and construction-wise, but very satisfying. Romp Around the Clock is a romper (yes, a knitted romper!) by Lilith Ubbelohde. I will admit to never having worn a romper before, so the styling for this one is pure fantasy! I love to pair aquas and teals with browns. I think the contrast of neutrals with brights is always a winner, and it's in style right now so I know others agree! The woven detail on the belt is in tune with the cable details and would be a great waist accent. An elbow-length sweater (one of my favorite sleeve lengths) is perfect for covering up when heading into air conditioning or as the day cools down. I love that Lily took into account the fact that most people aren't the same size on top as they are on bottom. That is truly the beauty of knitting or any kind of clothing DIY, being able to create garments that fit us in a way standard sized clothes never will. If you look closely at the pattern photos, the cable panel hits differently on the body between the two samples--another great way to customize this pattern and make it your own. The final design is also by Allyson, In a While Crocodile. 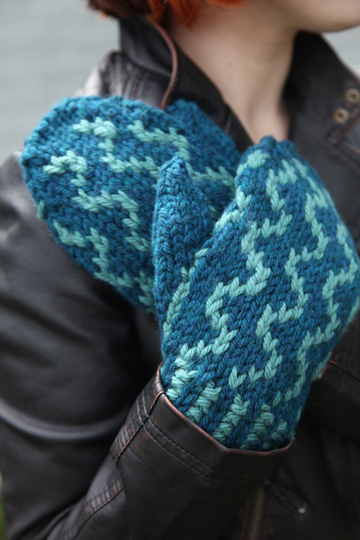 I love both sleeve versions equally, but I've been looking for the perfect pattern to try out Knit Picks Stroll Glimmer on and I think the version pictured above fits the bill. This would be the most versatile design in the collection for me, since I would wear it to work or out to play styled like this. Converse or Vans are my favorite shoes, the funkier the pattern the better! (I have Hello Kitty high-top Vans :P.) Add in a fun necklace and all bases are covered for a casual and youthful look. A common theme in this collection is 'choose your own adventure' knitting, as Allyson would say! Having a crochet option for the sleeves is great for novice crocheters like me, looking to practice their skills, or for advanced crocheters wanting to combine their crafts into one garment. Crocodile stitch would be over-the-top if used throughout this tee, and that little hit on the sleeves is juuuust right. A PDF copy of my Holla Back Tank Pattern. A copy of Gail's book, Hand Dyeing Yarn and Fleece. AND a copy of Gail's new color tool, the Color Grid. To enter, leave a comment on this entry telling me how you would wear one of the designs from the Holla Knits Spring/Summer 2012 Collection. Be sure to enter your email address when you comment so I can get in contact with you if you win! Contest closes one week later, at 11:59pm EST on April 25th. I will post the winner here and email you to arrange everything. And may the odds be ever in your favor!